Happy Valentine's Day to you! I know it's one of those holidays that most people pick a side for...either you love it, or you don't, and while it's easy to say, "oh, that's just for couples", I find it to be a beautiful day regardless of your relationship status. We're so often me-centered, and are quick to jump to feeling sorry for ourselves if we're not coupled up on this day, but can I submit the idea that perhaps we change our focus from amplified feelings of singleness & self-pity, to seeing this day as an opportunity to love & serve someone else. Who is in your life that you can encourage or appreciate? This is a great day to share the love, tell someone you care about them, and appreciate what they do. Have you noticed that when you take the emphasis off yourself, and make it about others that things seem to become better? In blessing another, you, too, are blessed. Also, if we look around, our whole world seems to operate on love, or the lack thereof, as we notice in the motives behind a person's actions. Everybody, whether they admit it or not, craves love; it's essential to our existence. We make decisions, create actions, and do everything on the basis of how we feel about love. This brings to mind a verse in 1 Corinthians. We are to be an example of love to those around us. 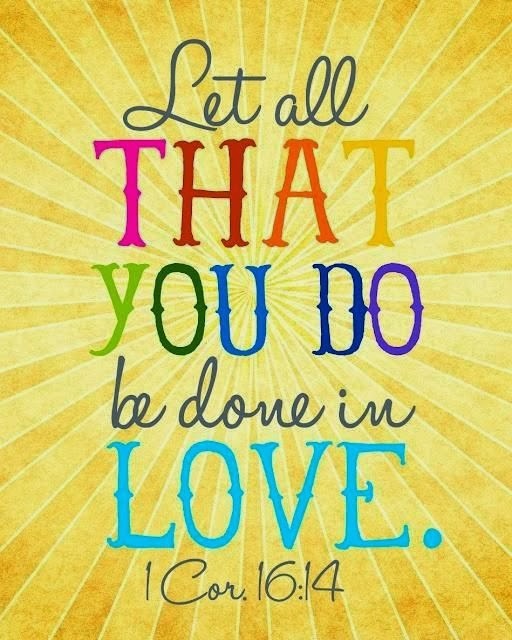 Everything we do should be an act of love, an extension of our heart, and as we have been loved by God, when we did not deserve it, so we should extend grace & love to those around us, especially those that may be a challenge to love. Take a look around you, examine your daily schedule, and ask yourself how you can show love to friends, family, those you work with, strangers...etc? Be love, show love, and share love! Wishing you a wonderful, beautiful and love-ly Valentine's Day!